Summer is here, the mercury is on the rise and Sydney is turning up the heat. Thanks to our friends at Youfoodz, we're bringing you this bumper list of the 50 Best Things To Do This Summer. There are three types of people in Sydney over the summer. People that beach every day. People that don’t. And tourists. 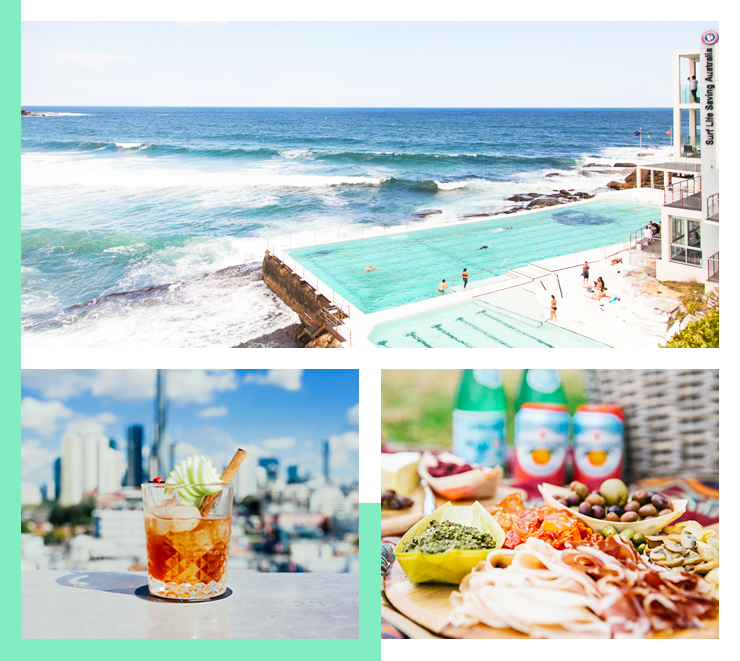 Wherever you fit in we’ve got you covered, with the ultimate list of 50 things everyone must do in Sydney this summer! Get ready to start ticking these bad boys off your bucket list people. 1. Now that the weather is bloody amazing, hit up an outdoor cinema (there’s loads around). 2. Head on over to Fort Denison for a classic Sydney Sunday session. Delicious food. Live music. And an epic view to watch the sun set. 3. Buy tickets to Field Day. Because summer isn’t really summer without a festival, duh. 4. Live off Messina when you're not eating Youfoodz (we’re talking breakfast, lunch and dinner). 5. Binge watch awesome short films at Tropfest. LBH, it’s probably a good idea to take a break from Netflix. 6. Cool yourself down at a classic Sydney ocean pool. 7. Go cray for Frosè – everybody’s doing it. 8. Pump the aircon, get a professional chef in (aka Youfoodz) and live like the Kardashians for a day, (gym sess and chicken salad anyone?) because living off Messina probably isn’t the best idea. 9. See the king of the jungle David Attenborough live because yes, he’s actually coming to Sydney! 10. Explore the largest ball pit (ever) and the mysterious house of mirrors at The Sydney Festival. 11. Take a ferry trip around the harbour (where you go is completely up to you). 12. Hit up these awesome drunk food eats (because we know the hangovers are real). 13. Or don’t, and keep that summer bod banging, courtesy of Youfoodz (because fast food that is actually healthy, does exist). 14. For everything art and music, Laneway is a must. Go get yourself cultured. 15. Hop your way around Sydney’s best rooftop bars. We’ve already done the hard work for you. 16. Get your hair did at Marli Rose - we both know your hair is loaded with sand and salt. 17. Water balloon fight. Because why the hell not? 18. Go surfing. And by go, we mean at least try it. Once. Extra-points for every nose-dive you deliver. 19. Check out Tatsuo Miyajima’s latest exhibition at the MCA (seriously, don’t miss it). 20. Do the Spit to Manly. Walk it. Run it. Gram it. The possibilities are endless. 21. Sample the spritz on tap at Casoni. 22. Host your own garage sale… there’s no better time to rid your closet of old clothes (and ones that still have the label on). 23. Find a not so secret, secret beach. 24. Go fishing. Fail. Then forget about it over an awesome seafood feast at Watsons Bay Hotel. 25. Spectate the talent (and hot bods) at the Australian Open Surfing at Manly Beach. 28. Or a bike at Centennial park. 29. Head down to North Bondi and get amongst for The Royal Croquet Club. Oh, and make sure you actually play croquet. 30. Picnic, walk or cycle your way around the Royal National Park. 31. Play tourist for the day at Opera Bar… we swear the view there gets better every time. 32. Have a picnic. With wine and a cheese board obvs. 33. Coastal walk the hell out of Sydney. We’re talking Rose Bay to Watsons AND Bondi to Bronte, then come home to a healthy dinner that’s already been made (thank you Youfoodz) for a night of good old R and R. Go on, you deserve it. 34. Grab your mates for a backyard camp glamp sesh. You’ve seen the instas. Do as the so-called influencers do. 35. Actually go glamping but without the effort. Where nature meets linen sheets and goose feather pillows. 36. Compete in the Manly Inflatable Boat Race. As you have probably guessed, it’s some pretty serious stuff. 37. Host a dinner party but order Youfoodz instead. It’s summer FGS – as if anyone has time for cooking. 38. Take a soapy, slippery dive at Slideapalooza. There’s no age limit to making a fool of yourself. 39. Roll on in to Bondi to watch the annual Bowl-A-Rama comp. It’s only one of the biggest skating events in the world, no biggie. 40. Hunt down the best cocktail jugs (or just use this list) because nothing says summer like a strong punch. 41. Spend a day at Luna Park. There’s no denying childhood nostalgia. 42. Dust off your skates and head to the retro roller disco pop up. Don’t forget your elbow pads. 43. Try #cleaneating for a week (and live off Youfoodz). New year, new you right? 44. Continue your health kick at one of Sydney’s best outdoor gyms. It’s worth it for the eye candy if nothing else. 45. Get your green thumb on and grow a herb garden. 46. Or if you’re a convicted plant killer, buy flowers at Sydney’s best flower markets. 47. Enjoy the sweet, sweet sounds of some of Australia’s best talent at Twilight at Taronga. The view’s not too bad either. Date night = sorted. 48. Cut loose by the sea at Bondi Pavilion’s Vibes on a Summer’s Day. You’d be stupid to miss it. 49. Have an afternoon nap. Everyday. 50. And when you give up on Sydney, roaaaad trip it with your best mates!